Tamora Pierce was a guest speaker at the National Book Festival this year and I was delighted. I was also somewhat shocked that the line to get a book signed by her started forming in front of the signing tent at least an hour before she gave her talk at a completely different tent, and several hours before she would start signing anything. I’m pleased that she’s popular, but I think the kids in that line made a mistake in going for a signature rather than listening to her speak. She’s a wonderful and witty speaker, with a certain acerbic quality that I enjoy. Seeing her at the festival was also my first notice that her next book has come out: Battle Magic. I put a hold on it at my local library and checked out Melting Stone. 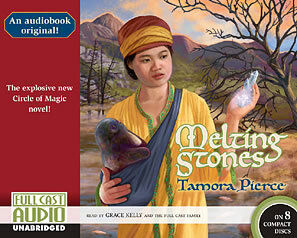 I grew up reading Tamora Pierce and I still love her books, but I hadn’t gotten around to reading Melting Stone, in large part because it was a born-audio book. While it also came out in traditional book format, that was only after it was published as a full-cast audio-book: meaning each character was voiced by a different voice actor and some sound effects were included, too. This is not the only thing that’s unusual about this book. The main character, Evvy, was first introduced in a different book, Street Magic. Street Magic, in turn, in the second book that focuses on the character of Briar Moss. Both of those books focused on Briar Moss are single parts in four-book series. Melting Stone also references a lot of events that happen in Battle Magic, a book that was only just published recently in 2013, some six years later. It’s hard for me to tell exactly, given that I know this book series quite well and for some time, but I think this book was intended to be able to stand alone and even introduce the universe to a new generation of readers, who can then go back, if they’d like, and read the backstory of the original books, but don’t have to if they don’t want to, and can continue to read future books as they come out. Anyway, it was fun, even though it was also intended for a younger audience even than most of Pierce’s books. As Kinsey noted in her last post, we all like reading YA fiction, but generally the audience of those books are teens or the particularly precocious, and the intended audience for this book was more elementary school. One of the things I love about well-written fiction is that it’s often also well-researched and you can learn a fair bit of non-fiction facts along with enjoying a story with characters and plot-arch. This book, in particular, I thought did a good job of including some basic geology for kids. So while I enjoyed the story and the characters, I was mostly interested in my own meta analysis of this book. Are audiobooks really becoming more mainstream and standard? Regardless of format, it’s rather brilliant of Pierce to break up the continuity a bit in order to bring in a new generation of kids. I wonder: are there people out there who grew up reading her books who are now introducing them to their own kids? This entry was posted in Fantasy, Young Adult Fiction and tagged melting stone, Tamora Pierce.